You can find Dame Nellie Melba’s picture on the $100 note. Peche Melba, Melba toast and even the Canberra suburb of Melba were all named after the soprano. 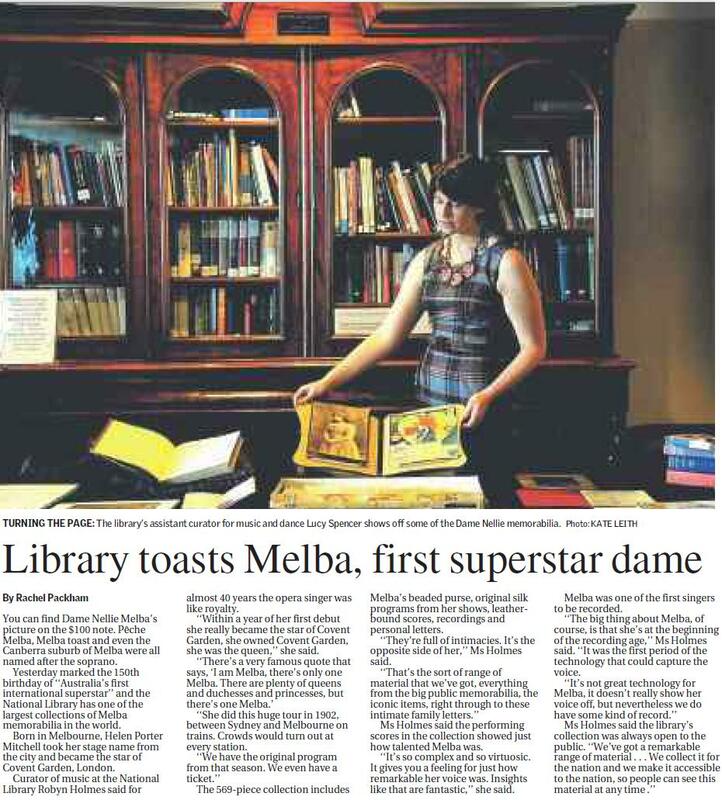 Yesterday marked the 150th birthday of ”Australia’s first international superstar” and the National Library has one of the largest collections of Melba memorabilia in the world. Born in Melbourne, Helen Porter Mitchell took her stage name from the city and became the star of Covent Garden, London. Curator of music at the National Library Robyn Holmes said for almost 40 years the opera singer was like royalty. ”Within a year of her first debut she really became the star of Covent Garden, she owned Covent Garden, she was the queen,” she said. ”She did this huge tour in 1902, between Sydney and Melbourne on trains. Crowds would turn out at every station. The 569-piece collection includes Melba’s beaded purse, original silk programs from her shows, leather-bound scores, recordings and personal letters. ”They’re full of intimacies. It’s the opposite side of her,” Ms Holmes said. Ms Holmes said the performing scores in the collection showed just how talented Melba was. ”It’s so complex and so virtuosic. It gives you a feeling for just how remarkable her voice was. Insights like that are fantastic,” she said. Melba was one of the first singers to be recorded. ”The big thing about Melba, of course, is that she’s at the beginning of the recording age,” Ms Holmes said. ”It was the first period of the technology that could capture the voice.